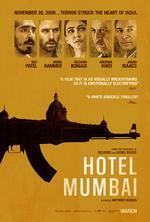 "What redeems HOTEL MUMBAI from morbid opportunism is that, in all but its slickest and most Hollywood moments, the thrills of Maras' heart-wrenching re-enactment are never an end unto themselves. " "No amount of words that can convey the sense of the film, because it is such a gut-punch of emotion." "Writer/director Anthony Maras largely sticks to the dramatisation playbook, but does so in an effective, affecting and empathetic fashion."